Elko, NV – June 23, 2015 – Lithium Corporation [OTCQB – LTUM] “the Company” is pleased to announce that it has received the results from the preliminary geophysical surveys at the BC Sugar flake graphite prospect in south central British Columbia. Due to the survey being conducted so soon after the snow melt the Ground Penetrating Survey did not prove particularly useful, as the saturated sediments near surface attenuated or absorbed the bulk of the radar waves – both transmitted and received, so that the data was sub par on four of the five lines. However the GEM-2 electromagnetic survey did pick up the mineralized zone, exhibiting a robust, wide anomaly in the area of the Weather Station showing, where the Company has made application to the BC Ministry of Energy and Mines to trench this year. Additionally the EM survey appears to have determined that the zone does extend to the west of the above showing in areas where it has not been previously mapped due to coverage by glacio-fluvial till. 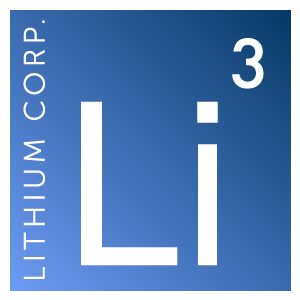 Lithium Corporation is currently evaluating the benefits of possibly expanding on the data acquired from this program. With respect to our Fish Lake Valley, and San Emidio lithium brine properties in Nevada the Company wishes to inform our shareholders that we were not able to negotiate an agreement with Kingsmere Mining Ltd. “It is unfortunate that we weren’t able to make a deal here, however we still remain committed to moving these properties forward, and possibly seeking other parties that may be interested in entering into a joint venture arrangement with Lithium Corporation.”, said Company president Brian Goss. Lithium Corporation is an exploration company based in Nevada devoted to the exploration for new battery related resources throughout North America, and especially looking to capitalize on opportunities within the ever expanding Lithium-Ion and next generation battery markets. The Company maintains a strategic alliance with Altura Mining, an ASX listed coal producer that is currently spinning off of its’ coal assets into a Singapore listed start-up. Altura then will focus on its 100% owned world-class Pilgangoora lithium pegmatite property in Western Australia.